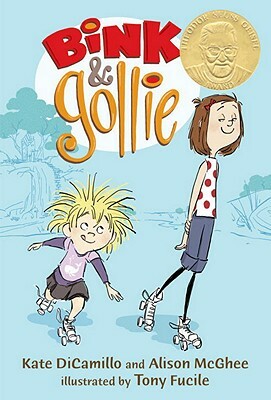 Gollie is reed thin, geeky, and archly judgmental; Bink is petite and down to earth...The plots serve mostly as a framework for DiCamillo and McGhee's sharp, distinctly, distinctly ungirly dialogue that makes every page feel like a breath of fresh air. And true to his background as an animator for Pixar and Disney, Fucile makes his inklike digital illustrations crackle with energy and sly humor. Reality is gleefully suspended here...appealingly oddball elements (roller skates, pancakes, rainbow socks)...expressive, cartoon-style drawings, including several wordless spreads, extend the sense of character, story, and madcap adventure. Children will have fun filling in all the spaces this high-spirited, quirky, and warmhearted offering leaves to the imagination. The authors demonstrate a pleasing ear for rhythm in just about everybody’s dialogue. Fucile’s illustrations give the girls their real presence: bouncing, soaring lines have a tousled cartoonish vigor that dominates every spread...With appeal both for reading aloud and alone, this might make an entertaining title for sophomore readers to share with younger kids, and they’ll relish teasing their tongues with Gollie’s vocabulary. It really is the best thing ever. And what’s more, it’s a book like nothing else you’ve ever seen. Nothing. Ever. Seen. Trust me on this one. I see a lot of books. We had to put the book down and just laugh uncontrollably on more than one occasion. I think it's safe to say we were giving each other looks that said: Could this perfect little creation be FOR REAL? Could it be any funnier? An odd couple for the 21st century, Bink and Gollie will circulate like mad, winning new fans at every stop. Three zippy chapters, they learn about compromise, individual quest and shared experience, and jealousy. Splashy drawings, mostly in black and white, further infuse energy, humor and honest feeling. Plots serve mostly as a framework for DiCamillo and McGhee's sharp, distinctly ungirly dialogue that makes every page feel like a breath of fresh air. And true to his background as an animator for Pixar and Disney, Fucile makes his inklike digital illustrations crackle with energy and sly humor. Excellent writing, good storytelling and top-notch digital art introduce two girls who bring Ramona and Pippi to mind. Headstrong but lovable Bink and opinionated but loyal Gollie are best friends — most of the time anyway — who enjoy each other and understand the importance of friendship. Hilarious and peculiar friends...delightful characters. Charming...Amply illustrated with Tony Fucile’ exuberant cartoons. Expressive illustrations by Tony Fucile provide lots of comic relief as the two friends grapple with issues like compromise and the need for personal space.